The Palace of Culture and Science, Warsaw, Poland. Photo by Claudia Marina. Over spring break, I, along with nine other students from Parsons School of Design and The New School for Social Research, had the opportunity to take part in an intensive course offered in Warsaw, which centered around the Palace of Culture and Science. If you’re reading this, you may have read Susan Yelavich’s post “Hacking Warsaw’s Palace of Culture,” which detailed the culminating group projects that resulted from the week’s hybrid seminar-studio class format. This intensive had particular emphasis on the intense if only because of the unique dynamic of the Palace of Culture. 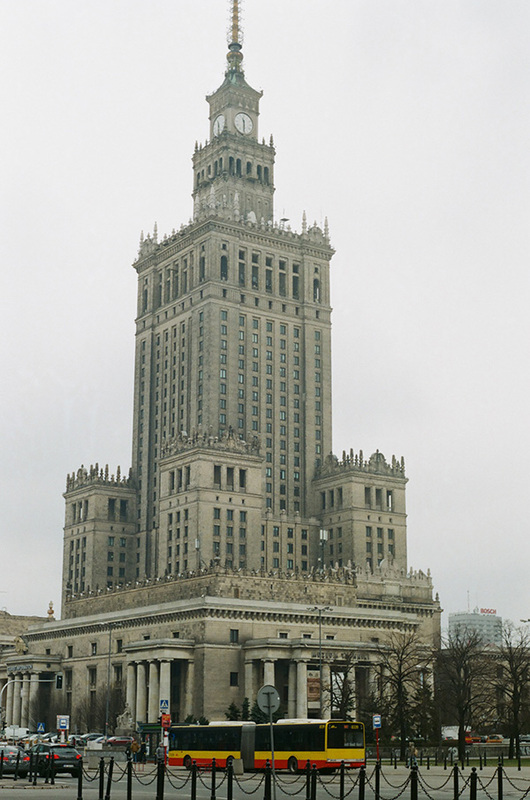 Infamously conceived as Stalin’s “gift” to Warsaw, we were told to consider the power at play when architecture is given as a gift without allowing its recipient to reciprocate similarly. In the weeks before flying out to Warsaw, we read several essays about, and examined numerous historic and contemporary images of, the Palace. (Especially important was Michał Murawski’s book The Palace Complex.) They reminded us non-Varsovians of the Palace’s domineering presence, both physical and metaphorical. So it was a surprise to me when I actually got there on a gray afternoon and stood across the street from the Palace at the modern shopping mall, Złote Tarasy, and thought…that’s it?